Cuts from the chuck are among the most popular cuts for pot-roasting (braising). They have plenty of connective tissues that melt when the meat is pot-roasted making it tender and flavorful. Beef cuts from the round and brisket are also used. 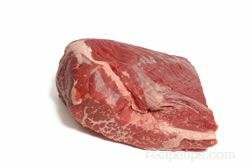 Cuts used for pot roast benefit from the moist heat of pot-roasting, which helps to tenderize the meat. The boneless shoulder roast is also know as the English roast and is located behind the arm roast. The meat is obtained from the seven neck vertebrae. Stew meat is also cut from this area. The bottom round is the outside muscle of the upper leg. The bottom round roast can be used as an oven roast if it is of the best quality, but it can become very tough and chewy if it is roasted too long. The best results occur when the meat is pot-roasted, which helps to tenderize it the meat. 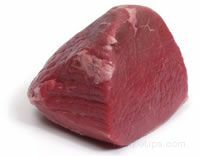 A boneless rump roast is sometimes sold as is or it may be rolled and tied before it is packaged and sold. The name, "standing rump roast" refers to a rump roast in which the bone has not been removed. It is also known as a bone-in rump roast. It is very flavorful and tender when pot-roasted. The eye round is the eye muscle of the bottom round. The eye round roast is boneless and can be a bit tough, so it is best to cook it with a moist heat process such as pot-roasting. The top round roast is obtained from the top round muscle. It is one of the better cuts from the round primal in terms of flavor. Pot-roasting is still the recommended cooking method for a top round roast, because it can be a bit chewy if cooked with dry heat methods. The round tip is next to the sirloin tri-tip so it is a bit more tender than other round roasts. It may be oven roasted if it is of top quality and it is often cut into pieces for use as kabob meat. The brisket is located between the fore shank and the plate. It is usually sold boneless and it is flavorful, but tough. Pot-roasting helps to make the meat more tender. A full brisket may weigh 10 pounds or more, so it is usually cut into two sections. The front half is known as the point cut, thick cut, or deckle. 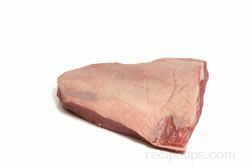 The back half is known as the flat cut, thin cut, or brisket-deckle-off and is more commonly found in food stores than the front half. It is also a common practice for food stores to cut both halves of the brisket into several portions and offer them as smaller roasts. The flat cut is lean, but it has a layer of fat on the surface while the point cut contains more internal fat than the flat cut. The fat helps to moisten the meat when the cuts are pot roasted.